McDonald's (MCD) got a letter from 550 health experts Wednesday accusing the fast food giant of ignoring the impact its products -- and its marketing -- have on America's children. "McDonald's and industry front groups have refused to address the dangerous toll that fast food and predatory marketing is taking on our kids," they wrote. "In the decades to come, one in three children will develop type 2 diabetes as a result of diets high in McDonald's-style junk food, according to the Centers for Disease Control and Prevention," the experts noted. The letter, which also attacked Ronald McDonald as a marketing toll which helps the fast food company draw in younger customers, ran in several papers around the country, including large metros like The Chicago Sun-Times. At an associated Letter to McDonald's website, consumers were encouraged to add their signatures, and "Invite your friends and colleagues to sign the letter" via email, Twitter or Facebook. Several famous doctors were signatories, including Hans-Olov Adami, M.D., Ph.D., chairman of the Department of Epidemiology at the Harvard School of Public Health, and William C. Roberts, M.D., the executive director at the Baylor Cardiovascular Institute. In response, McDonald's has said that it is proud of the food it offers, and that Ronald McDonald teaches children to be active. Ultimately, McDonald's may not care much about this latest critique.The letter may be a public relations distraction, but McDonald's food has been under fire for years, to no apparent effect on its bottom line. McDonald's shares have risen by more than 120% in the last five years, which is well above the Dow's improvement of less than 20%. During the same period, its earnings and sales have moved higher, and McDonald's has returned billions of dollars to investors via share buybacks and dividends. The stock currently has a yield of 3%. Same-store sales at the chain were up 6% in April, which beat Wall Street's estimates. 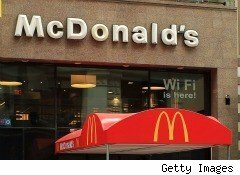 So far, critics of the fast food company's menu and marketing have made no visible dent in McDonald's success.